Four years ago today, this comprehensive nationwide overall was released with celebration and fanfare that even included a Ben Folds concert. Breaking down the arts into five disciplines: Music, Visual Arts, Media Arts, Dance, and Theatre and then further breaking those down into four key processes: Creating, Performing, Responding, and Connecting. These sought to both redefine and streamline the way we teach the arts. Yet, as with all new things, teachers in the arts community have been slow to adapt them. Many arts teachers are in this field because of a lack of standardization and oversight that allows for individuality in the classroom, and then even in the standards there is differentiation – in music for example the NAfME standards aren’t the same as the IL Core Arts Standards, and finally there are others who just don’t care or don’t even know. 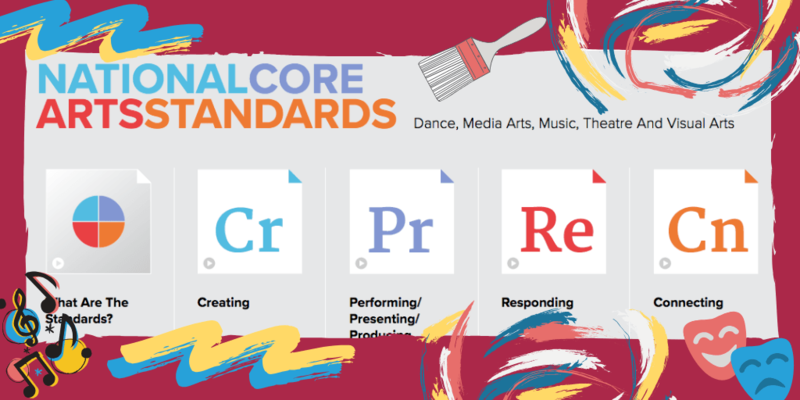 As someone who simultaneously works very close with the standards and as an active arts teacher, I wanted to talk about why the arts standards matter. As an art teacher I love the freedom and flexibility that I have in my classroom and the control I have over my curriculum is unparalleled. I quickly made the choice to stop teaching recorders to protect my ears (and sanity) I have my 5th graders take up bucket drumming, and 6th graders begin the ukulele. I know there are many teachers who feel the same way, and have a scope and sequence that spans years – something unique to the arts. However what if my student transferred to your school, or I took in your student? Would they be able to transition in my program? In other words, do our program align and do they prepare students to make the switch? This is repeated en masse every year as students graduate and proceed to high schools/colleges around the county. Did their previous program prepare them for the new one? It is in this way that the standards are vital to create some sense of uniformity among arts instruction. The standards strive for both a broad and general alignment, so that the students may gain the strong artistic building blocks that should be present in any decent arts program. Furthermore, the four key processes are broken into smaller “anchor standards” that can help you align your own program. These vertically aligned standards let you see what a student at grade level should be doing, but they also let you see is what a student above or below that grade level should be working on. If you have an advanced student and are looking for ways to challenge them, see what task is required of a grade or two above them, have that 4th grader do 6th grade work. They’re so closely aligned that you wouldn’t have to create an entirely new assignment or task, but rather extend and deepen the content of the one that already exists. This works similarly for a class or student that is struggling. Look at their work, listen to their feedback, see if what they’re saying falls somewhere on the standards spectrum and simplify it. It is in this way that the standards can help you with internal alignment, as well as a larger sense of what any student across the country should be working on. When I wanted to start my bucket drumming program, I was told that there just wasn’t enough money in our budget for something like that mid-year. I personally went to to Home Depot and solicited donations, I used money from a CPS Arts Essentials Grant, and even began writing a Donor’s Choose for the remaining supplies. Eventually my school offered to reimburse me for the materials if I bought them and submitted receipts. So here I am, beginning a brand new arts program at my school. However it is wasn’t for my personal drive and commitment, if I hadn’t been there advocating for my self and this program every step of the way, it never would have happened. Yet, when our math scores at the school weren’t up to snuff this past year we invested in a band new curriculum without a second thought. Now, again most arts teachers would prefer to not have administration drop a script on their desk and say “teach this.” However there is an unspoken message being delivered here that everyone already knows; that there is a hierarchy of subjects. Reading and math are obviously top tier because of test scores and funding, but that doesn’t explain why other subjects are consistently valued higher than the arts. I’ve heard the argument that science connects to math, or that social studies is essential because it teaches civics (it doesn’t) but as an art teacher I would argue that the skills, planning, and thinking strategies our students develop have just as much, if not more, of an impact on their personal and academic development. The standards are your platform form advocacy here. They’re the tangible document you can bring to your administration and say, if you want a success arts program this is what I need to do. They offer you a rationale and justification as to what and why you do what you do in your rooms. It was what let me say that my 5th graders needed to “compose simple rhythmic phrases within a form that conveys their expressive intent.” I alway feel validated when I can point to a document with as much weight a the National Arts Standards when advocating for not just my program, but the importance of the arts in general. The four core skills that they focus on: Creating, Performing, Responding, and Connecting should appear as foundations in your program. This should be obvious to most, but in case it isn’t this is why we have the standards. I know there are music teachers out there who put on a half dozen concerts and performances per year. Performing is obviously an integral part of any successful music program, but those students need to be allowed access to the full spectrum of music education. Instead of a non-stop practice & production cycle, take a moment and break a piece down, analysis it, respond to it, connect it to your students lives. Not only will it engage them by making it real and relevant, but also they’ll be better musicians and artists because of it. It is in this sense that the standards strive for a universal artistic alignment developing artistic literacy (aka critical thinking) in all our students. I don’t think there is (or will ever be) a singular definition of what it means to be “artistically literate” but I was amazed at how well these four skill encapsulate the skills needed in pretty much any artistic discipline. 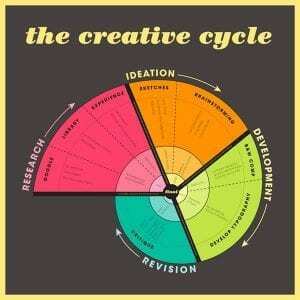 It reminded me of the Creative Cycle and how essential those basic skills are to the creative process; making those processes equally essential to artistic literacy. Also a comprehensive list of Best Practices can show you the specifics of what they should be doing during those processes. Much like the way the standards help with alignment, they also can guide you through what processes you are doing well in your classroom, and which you need to focus on. CPS Arts developed this amazing self assessment tool. That I’ve used frequently when planning out a big unit or getting my formal observation. A simple checklist to help you quickly evaluate your teaching and a great tool to help hold you accountable to developing well-rounded artistically literate students. In conclusion, I know there are a lot of opinions about how valuable or effective standards are, especially in a field like the arts. However, I’ve been impressed with the thoroughness and subtle depth of these art standards and have been consciously incorporating them into my teaching practice. I’ve been using them when planning, refer to them when self-evaluating, and referencing them when developing assessments for my students. They’re should be seen as a tool, a boon for art educators, and not a burdensome regulation. They’re as useful as you allow them to be, but offer a great starting point for alignment, advocacy, and artistic literacy.